Qravity – is a digital entertainment production studio and distributor where decentralized creative teams get royalties for their work. Qravity is a digital entertainment production studio and distributor where decentralized creative teams get royalties for their work. Qravity provides a space for creative visionaries to collectively develop original monetizable digital content, including movies, music, games, e-books, and applications. The platform uses virtual tokens on the Ethereum blockchain to track digital content creation, distribute project stakes among creative team members, and bring Qravity-produced content directly to market. Blockchain technology makes the platform’s transactions transparent in terms of revenue, product distribution, and profit sharing. Generally speaking, Qravity improves collaboration and eliminates obstacles as producers and creators conceive, develop, and distribute unique content that consumers crave. The Qravity team is devoted to helping creatives overcome the myriad challenges that hinder digital content projects. To accomplish this mission, we are developing a truly unique and powerful digital content production and distribution platform – a platform that harnesses blockchain technology to unite remote resources and provide the tracking, trust, and security required for successful collaboration. We want to give remote creative teams the same transparency and trust during collaboration as localized teams, with Qravity acting as a meeting point that enables creators to bypass chronic obstacles such as little to no exposure or recognition in their field, doubts about project success, reduced individual accountability, and uncertainties when equating contribution to equity. For individuals and start-ups, the market remains challenging. Financial hurdles (such as large overhead and a lack of private investment funding and government grants), inadequate infrastructure, difficulty finding sufficient resources with core skills (design or development), and limited access to major development companies often cause project postponement, abandonment, or cancellation. 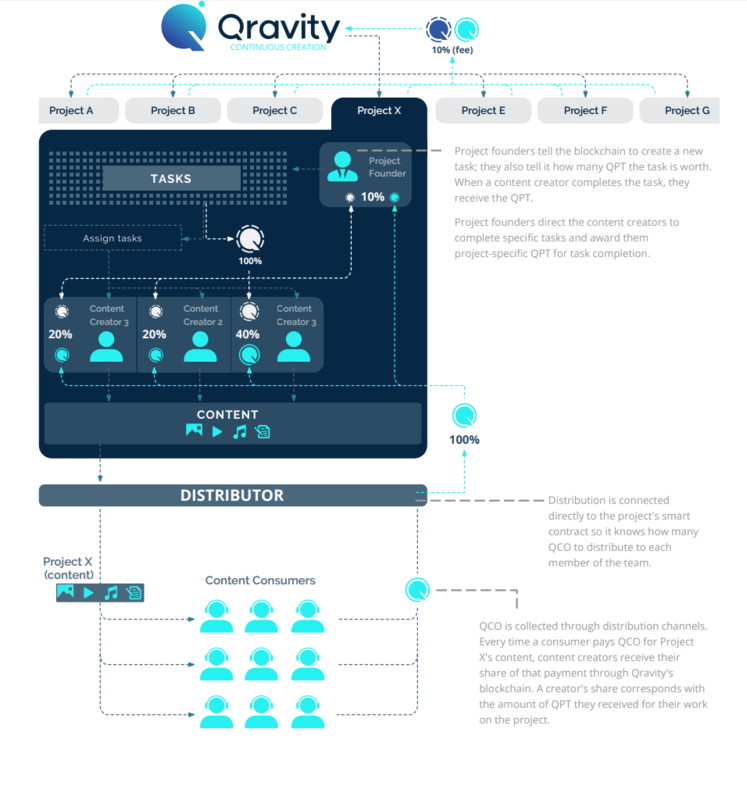 Since no platform was capable of offering the desired framework – a combination of crowdsourcing, project management tools, cloud-based collaboration, transparent project stake distribution, and social network features – Qravity was conceived. Its concept is founded on content creators being ready, willing, and able to invest their time and skills in exchange for ownership of the final product; essentially, crowdsourcing and crowdfunding at the same time. We built Qravity to help facilitate clear, productive communication between collaborating digital content creators, and to manage and track the contributions of every creator. 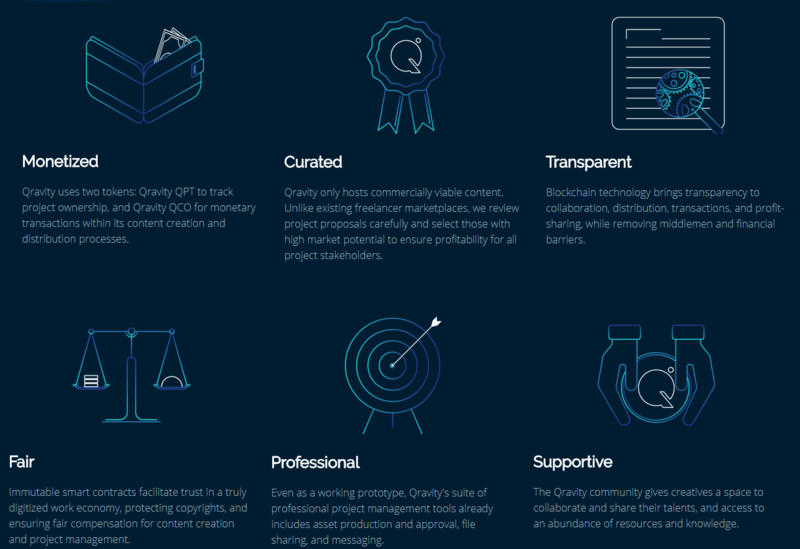 The Qravity platform is a decentralized digital content development and distribution platform with integrated project management tools, including asset production and approval, file sharing, and messaging for community and team communication. Project team members use these features according to their role. For example, founders can use the platform to direct their creative teams, while creators can track their progress and stakes. Upon project completion, Qravity brings the content to market, making it consumable through its platform, selling rights to distributors, and selling directly through third-party digital marketplaces like app stores and streaming services. The implementation of blockchain technology (smart contracts) ensures that every contribution that a content creator makes to a project is immutable. Qravity rewards creators with shares of project ownership for each contribution; whenever a creator completes a specific task, they receive the number of Qravity Project Tokens (QPT) that the project founder has assigned to that task. These QPT are tracked and created within Ethereum smart contracts, making them unique to specific projects and virtually immune to forgery or fraud. Regardless of the size or complexity of the tasks, the more tasks a creator completes, the more QPT they earn, and the greater their share of project ownership. Creators receive payment in Qravity QCO, the platform’s currency, which is tradable on exchanges. The amount of QCO they receive corresponds to the amount of QPT they earned for their work. For most, if not all, project founders, the interdependent processes of project planning and development can be complex and, at times, overwhelming. 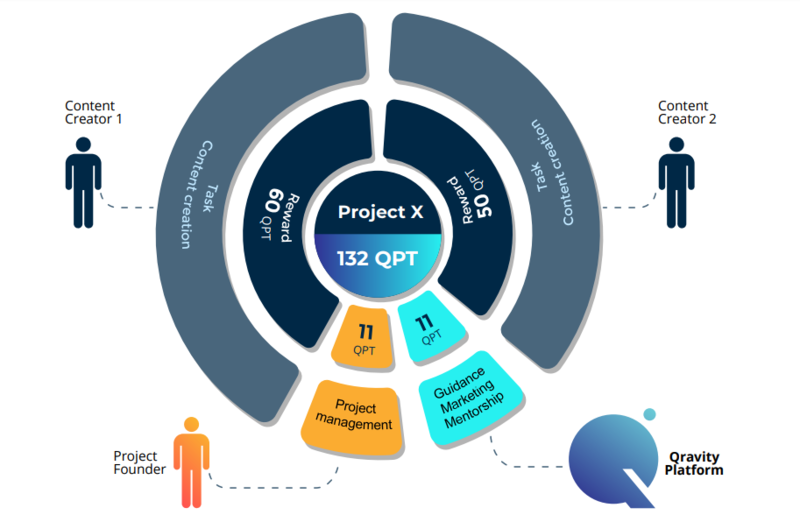 To help them achieve their vision, the Qravity platform includes a full suite of project management tools for creating project plans, assigning, tracking, and reviewing tasks, and communicating through a unified messaging system. After they’ve developed their project’s plan, the project founder can leverage “cashless” crowdfunding by incentivizing content creators to invest their time and skills into a project. For both project founders and content creators, the risk-reward motif applies to all projects: the more time and resources spent on a project (risk), the greater the chance of a large return (reward). Naturally, success is determined by many factors, and the results are not generated linearly, but Qravity is built on the idea that continuous efforts with the appropriate support, freedom and skill will ultimately succeed. We know about some of the problems that blockcases face, so we analyze off-grid and Ethereum-developed scaling solutions. As the use of blockrooms grows, we will need to ensure that Qravity can overcome the block scaling problems. We have the impression that the Ethereum Foundation is working to solve the problems of scaling and production efficiency. We will not depend on the founders of Ethereum for these solutions and will look for potential alternatives as the platform is created. The platform uses the Qravity QCO (QCO) markers for all money transactions. Anyone can buy these tokens from ETH during the sale of Qravity tokens. After the sale, QCO will be available on third-party exchanges. Qravity Project Identifiers (QPTs) are project-specific markers that track ownership of a project; in other words, they represent shares in the project. QPT are for internal use only and cannot be purchased. These tokens are created and passed on to the creators of the content in exchange for the work they do for the project. The content creator can perform tasks and therefore receive QPT from several projects. 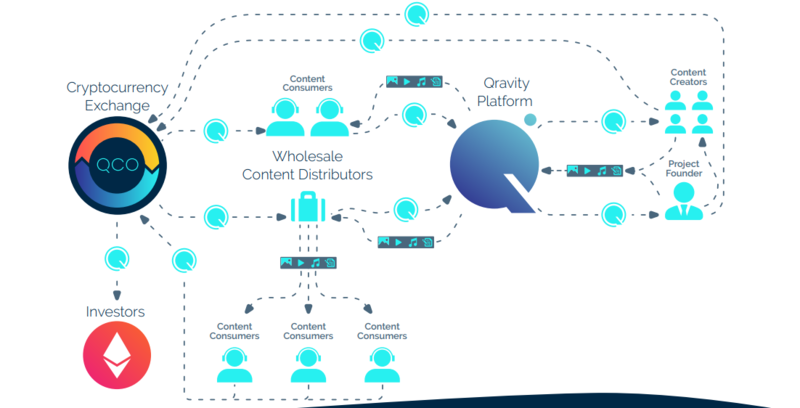 Every time a consumer or distributor buys content on the Qravity platform, the creators receive part of the payment in QCO based on the amount of QPT they earned for their contribution to content production. The more tasks they performed for a particular project, the more QPT they earn for their work on this project. First round of angel funding. Platform launch, production of “Lizzard Maddoxx“ starts. Exhibting Qravity and LM at MIPCOM. Qravity accepting new digital content project submissions. Distribution & monetization of “Lizzard Maddoxx“.